We're excited to share four enhancements to the Amazon DSP user interface that we’ve made over the past few months. We prioritized these updates based on your feedback, and have focused on streamlining operations in the following areas: navigation, bulk editing, custom reporting, and creative moderation. One of the biggest changes we made was to the overall look and feel of the Amazon DSP. Navigating within the Amazon DSP is now more intuitive and efficient. In the new layout, buttons, toggles, and campaign status information are now more prominent. You can now bulk edit the domain, audience, and location targeting settings for line items. Once you specify the new settings, you can apply them across all of the line items selected. 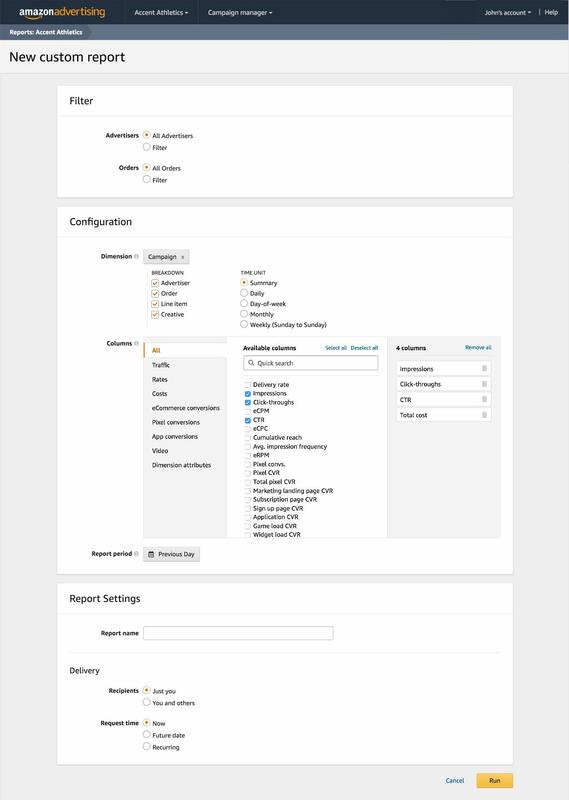 This feature allows you to create a report based on your unique requirements and save it within the Amazon DSP report center. You can now select the exact columns you would like to include. Once you run a custom report, it will appear in the report center and will be emailed to the recipients you specify. We're working on a number of improvements that will reduce the turnaround time for creative approval. For example, we’ve significantly reduced the average time it takes for you to be notified if your creative needs to be revised. Further usability enhancements are planned throughout the year. Connect with your Amazon DSP support team or get in touch with an advertising representative for more information.